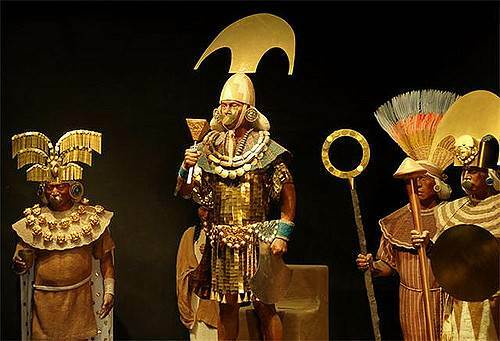 If it is that we have visited the ruins of the Señor of Sipán , we have been witnesses to the great quality in the jewelry finishings that covered one of the largest dignitaries of Pre-Inca Peru, specifically of the Mochica culture. Being an old civilization, the inhabitants of the valley of Molche developed in various fields of craft, emphasizing mainly in the handling of metals, especially copper and gold: their more important resources. From the handling of gold and of copper, they managed to discover the first process of covering a metal by another in the history of humanity, process that was discovered in Europe seven centuries later. The working mochicas learned to melt gold on metals and covered the copper with it, dominating to the perfection its alloy. Due to the abundance of these metals, they were reserved for the ornament of the priests and of the armies. The Mochicas knew very well the physical properties and chemistry of these elements, which served them to develop diverse techniques of extraction and natural processing utilizing elements as salt, coal and antioxidants. The moches jewels are a lot more sculptural than its ancestors and they are distinguished by its hammered and embossed qualities. They utilized traditional elements of their iconography, portraying especially their Gods and tributes to the dead persons. Among its typical objects can be found the popular masks of the deceased, which possess engravings that try to resemble the human face embedded of precious stones as the turquoise. Likewise, due to the great importance of the warriors, earflaps were manufactured to distinguish them from the rest. On the other hand, they were the first American civilization in utilizing the metals by way of armors, which served of a lot to expand their borders toward the sea. The major exponent of its art is found in the Museum of the Señor of Sipán , one of the few tombs that were rescued by the archaeologists dedicated to study this old civilization. In it we can find the fine decorative details that had the large señores at the moment of their death and how the art of metal alloy was totally dominated by this preinca culture.